What is First Class Mail? First Class Mail is the most popular and economical way to send items through USPS. You can send standard postcards, letters and large envelopes and small packages up to 15.99 ounces using First Class Mail. If your First Class package is over 15.99 ounces, you must upgrade the mail class to Priority Mail. 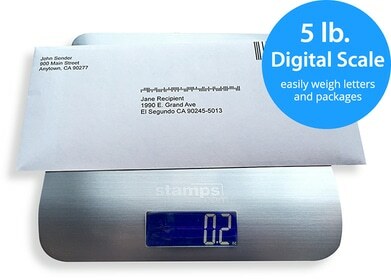 You can attach stamps to large envelopes and small packages to be sent through First Class Mail as long as you’ve met USPS’s weight restrictions. It costs $1.00 to send the first ounce of a large envelope and $2.66 and up for the first 3 ounces of a small package. Letters that can’t be sent through the Post Office’s automated machines have a $0.15 postage surcharge; the shape of the letter determines whether or not it is subject to this surcharge or not. Find out more about how shape affects the price of First Class Mail. You can purchase additional services for your First Class Mail item. Certified Mail is available for all pieces of mail sent through First Class Mail. USPS Tracking and Signature Confirmation only are available for small packages sent through First Class Mail. If you are sending a post card, Registered Mail, Return Receipt, insurance, restricted delivery and COD are not available. 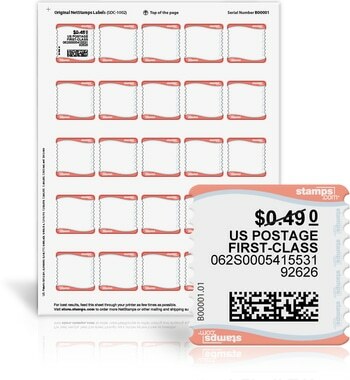 Send First Class Mail Online: Stamps.com customers have an advantage when sending First Class Mail. The online postage company is one of the only PC Postage vendors that allow you to print first class postage online. This includes First Class International Mail which is hugely popular with eBay sellers. 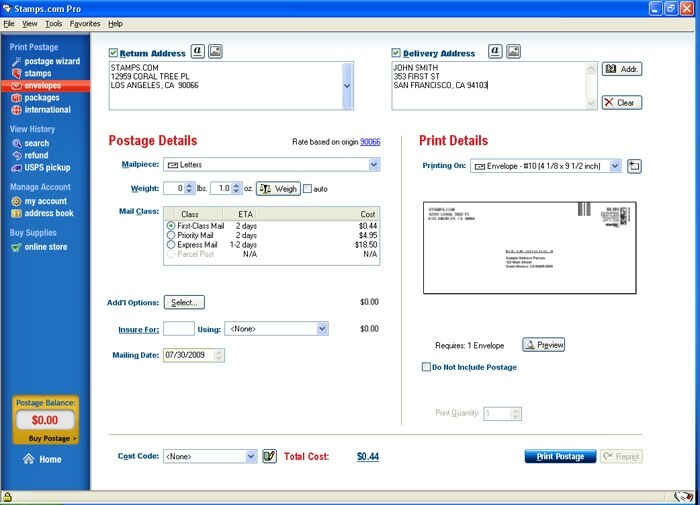 Other vendors such as Click-and-Ship and PayPal require you to upgrade to a higher, more expensive mail class such as Priority Mail. Print Exact Postage: Stamps.com also gives you the flexibility to print the exact postage amount on every stamp, whether it be one ounce or five ounces. Additionally, we offer free software upgrades each year when the USPS performs their annual rate adjustment, ensuring that you'll never need one or two cents postage stamps again. Discounted USPS Tracking: Stamps.com offers free USPS Tracking for small parcels sent through First Class Package Service.